A perfect addition to any kitchen, whether amateur or professional, our Blendz will be enjoyed by all. Use each blend differently to add a burst of flavor, vigor and passion to your recipes. Peel and dice squash and onion into one inch cubes. Roast vegetables at 375 degrees for 30 minutes with extra virgin olive oil, salt and pepper. Dice applies into one inch cubes and add to vegetable stock with Chef Guy's Moroccan Jerk Blend, curry and cilantro. Add roasted vegetables and simmer until tender - approximately 20-25 minutes. 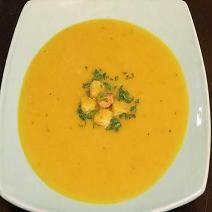 Puree, garnish with homemade croutons and cilantro and ENJOY!! Sereves A LOT! The PEI Co. Store carries our full line of Blendz. Known for their warm, friendly service and beautiful selection of PEI specialty goods and foods, The PEI Co. Store is the perfect spot for a true Island shopping experience. Christmas is coming...grab some Blendz at MR Seafoods They make great stocking stuffers!